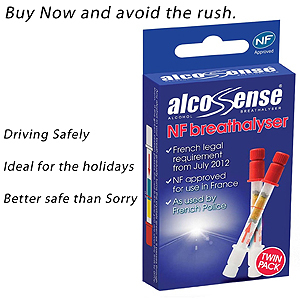 These are the correct NF approved breathalysers, so meet the legal requirement, other cheaper versions on the market may not be NF approved which will mean they will not cover you for driving in France. 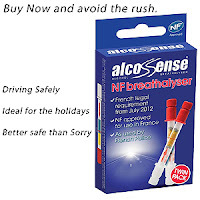 From 1st July 2012 all vehicles travelling in France must carry an NF approved alcohol breathalyser. The AlcoSense Singles NF fulfils this requirement and will keep you legal. This breathalyser is designed to alert you at the lower French drink drive limit of 0.5% BAC. You can't tell when the alcohol's cleared your system, but the AlsoSense Singles can. Features: Shows your alcohol level in 2 minutes. Complies with French NF Breathalyser Standards. NF marked so can be legally used in France. 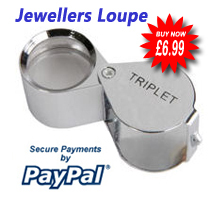 As used by the French Police Force for roadside screening. When you pass the red line you are over the French drink drive limit. A minimum of 2 NF approved disposable breathalysers must be carried in your car at any time while in France. I purchased these Breathalysers about 1 month ago because I am staying in France. So far the French police have not stopped me so I could not possibly comment on how they function, but when/if I am stopped the Breathalysers are sitting in the glove-box preventing me from being fined for not having them, so for me there serving there purpose 100%, I could not be happier ! Best price and arrived in two days! Have not had to use them but have seen them for two times the price in motoring stores!